Lima Senior’s Jaleel King puts up a shot against Ottawa-Glandorf’s Ben Westrick during Tuesday night’s game at Lima Senior. 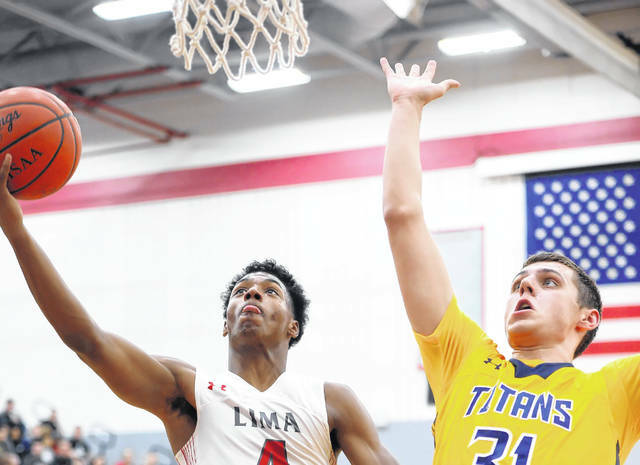 Lima Senior’s Khalil Luster puts up a shot against Ottawa-Glandorf’s Owen Hiegel during Tuesday night’s game at Lima Senior. 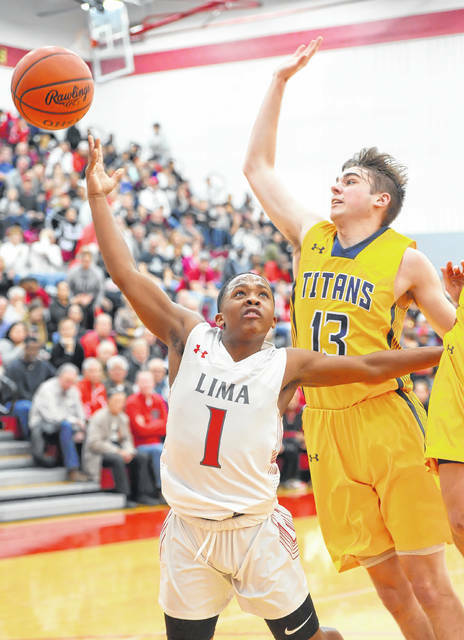 Lima Senior’s Khalil Luster shoots against Ottawa-Glandorf’s Carter Heringhaus during Tuesday’s game at Lima Senior High School. Ottawa-Glandorf’s 58-57 boys basketball win at Lima Senior on Tuesday night was a game in which both teams were on fire from the beginning, but the biggest spark might have come from O-G senior guard Carter Heringhaus. Heringhaus led the Titans (16-3) with 16 points and 12 of those came on four consecutive 3-pointers in a span of 4 ½ minutes late in the third quarter and early in the fourth quarter. Lima Senior (15-4) had erased an eight-point O-G lead and tied the game at 35-35 on a breakaway dunk by Jadakis Mack with 2:50 left in the third quarter. But on Ottawa-Glandorf’s next three possessions Heringhaus hit 3-pointers from deep in the left corner, with a Lima Senior basket in between, and the Titans’ rebuilt their lead to seven points. “Oh my gosh, he (Heringhaus) was feeling it and we just had to keep getting him the ball. He was unbelievable and he definitely sparked us to get that win,” said O-G point guard Owen Hiegel, who scored 15 points of his own. Ethan White also had 12 points and pulled down 8 rebounds and 6-7 post player Ben Westrick scored 9 points and had 11 rebounds. 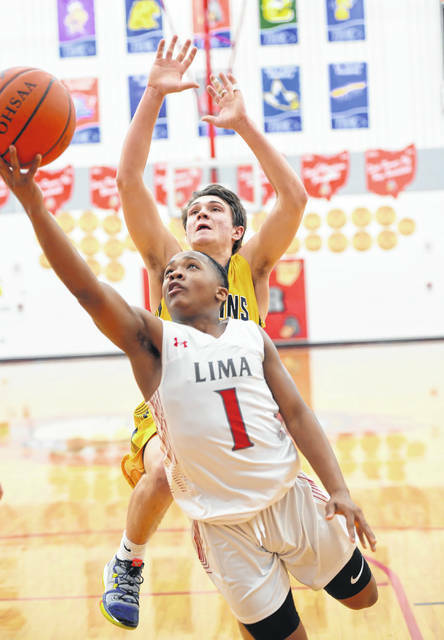 Josiah Fulcher led Lima Senior with 16 points and Jaleel King and Amihr Curtis had 10 points each. “It was a great high school basketball game with both teams going back and forth and both teams making plays down the stretch. We were on the other end of a game like that Saturday night (a two-point loss to Lexington). So for our guys to bounce back against a really, really good team on the road, I give our kids a lot of credit,” Ottawa-Glandorf coach Tyson McGlaughlin said. “They put a ton of pressure on us and I thought our guards did a fantastic job. Owen is Owen. I’ve said all year he is the best point guard in Northwest Ohio, maybe the best player. He more than held his own against a really good team. “Carter Heringhaus has been struggling a little bit but he put in a lot of time this week. He stepped up big for us,” he said. There were seven lead changes in the fourth quarter. O-G led by four points with 6 ½ minutes to play but after that the biggest lead by either team was two points. Lima Senior tied the game 57-57 with 1:19 to play when King picked up a loose ball after a missed free throw and scored. The Spartans got the ball back and were running the clock down when Fulcher was called for a foul when he pushed White in the chest with 30 second to play. The decisive point came on a free throw by Hiegel after Lima Senior was called for a foul for holding him on an in-bounds play after a timeout with 10 seconds left on the clock. He hit the first of two shots to put the Titans in front 58-57. Lima Senior called a timeout with six seconds to play and had a shot to win but King’s drive to the bucket under heavy defensive pressure missed. Ottawa-Glandorf led 28-24 at halftime after a first half that was even closer than the score showed. In the first 16 minutes of the game, there were 12 lead changes and there were seven other times when the game was tied. Lima Senior’s biggest lead was three points at 15-12 in the first quarter andd 20-17 early in the second quarter. Ottawa-Glandorf’s largest lead was its four-point advantage at halftime. Hiegel and White each had nine points in the first half for O-G and Fulcher got 10 of his points in the first two quarters. Lima Senior coach Quincey Simpson was not available for comment after the game. This entry was tagged limasenior, ottawaglandorf. Bookmark the permalink.